Added following NPC civilians to the city: a Woman and a Man. 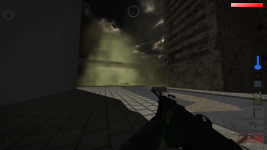 Added gas clouds, that move in the city, which will damage you. Added road signs to crossroads. Added a computer desk to indoor furniture. Added so that body temperature drops faster when it’s raining. Fixed a bug where cursor wasn’t visible when returning to menu. Updated cars to be stronger now so that they don’t break so easily on ramps. Patch v0.34 with shotgun and more!